These staircase design ideas concentrate on the design decisions that can add a little bit of magic to your staircase. 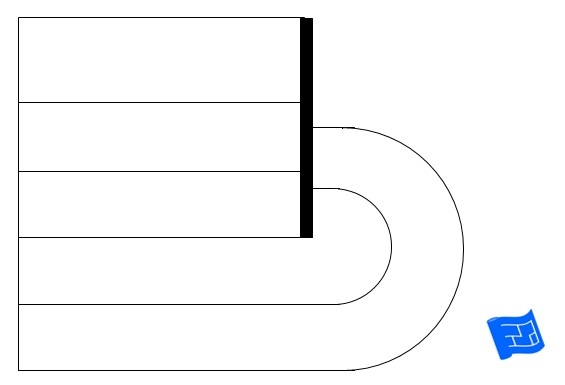 Should your treads be open or closed? What are the different options for designing the handrail? 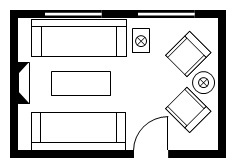 What design touches can I add to make traveling up and down stairs a pleasure? 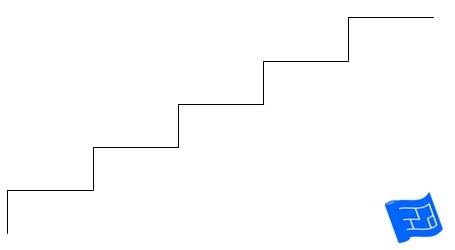 This page is part of the staircase design series. 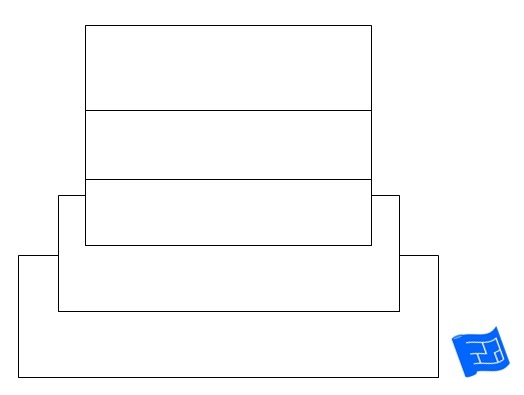 This page on what type of staircase covers the generic design of staircases and complements this page. 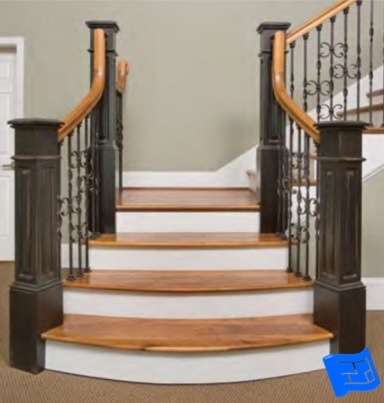 There are several structural options you can consider for your staircase. They are very connected with the look and feel that you want your stairs to have. Firstly you can have built-in stairs where the area below the stairs is used as storage or perhaps a small room such as a guest bathroom or a small office. Watch out for the door under the stairs dimensions mistake! Another option is to mount your stairs on stringers and leave the area under the stairs in the open. The risers can be left open for an airy feel with the stringer in the center, using 2 stringers, or maybe off-setting the stringer. This next staircase design idea is the ultimate in airy. It’s a cantilever design where each tread is supported only from the wall with the risers left open. It’s as if each tread of the stairs is floating on air. This effect is produced with some nifty structural engineering. Alternatively, the the risers can be left in place, and the underside of the stairs finished to lend the staircase a more solid feeling, but still leaving the area below open. 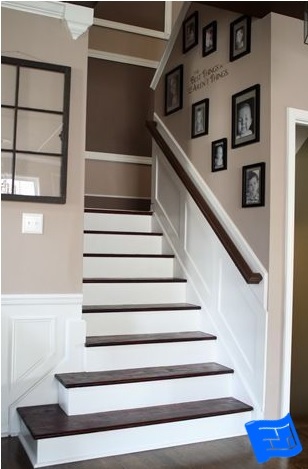 If you go for a more solid look the underside of the stairs is now a design opportunity where beautiful wood or plaster work can be used for decoration. 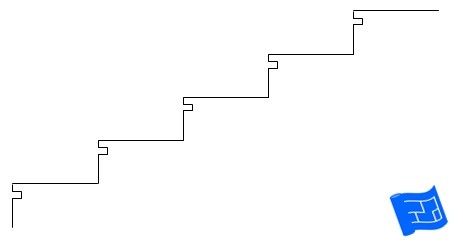 The final option we’ll cover here is what I call a suspended staircase where a spiral or box is suspended from the ceiling and extends downwards so. It's as if as there's a space ship putting down steps so that you can climb aboard the mother ship. Maybe I’m getting a bit carried away with the alien analogy here but take a look at these examples and see what you think. 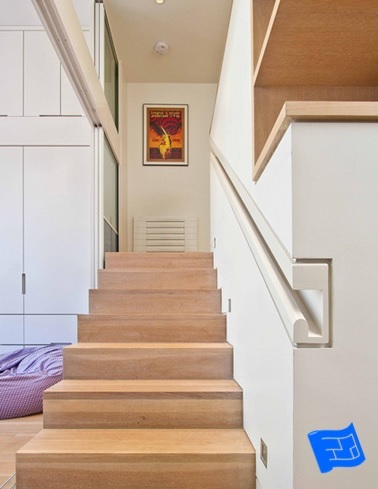 Here’s some design features that you can consider for your stairs to give it the wow factor. I’ve mentioned elsewhere that your staircase is a great place to display art, objects or photos. 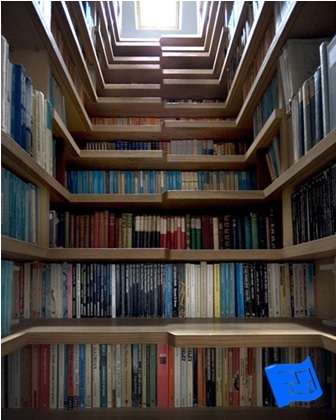 A built-in niche or shelves facilitates this wonderfully. I recommend putting in niches or shelves at the top of the bottom of the stairs or on flat landings. I lived in a house once that had a lovely niche in the wall on a climbing portion of the staircase. I noticed that no one ever stopped to look at what was in the niche. This was due to the fact that it’s not really natural to pause mid flight and the niche was perpendicular to the direction of vision and it isn’t really natural to look sideways when going up or down stairs. It was a waste of a great staircase design idea. 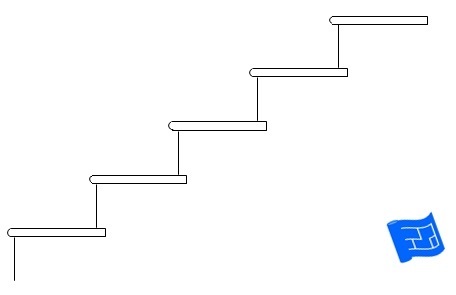 You may have noticed that some staircases have steps that wrap around the bottom of the flight of stairs. It’s a lovely feature that can be implemented on even the most modest of staircases. It has the effect of grounding the staircase and accentuating the start of the climb up the stairs or the arrival at the bottom. 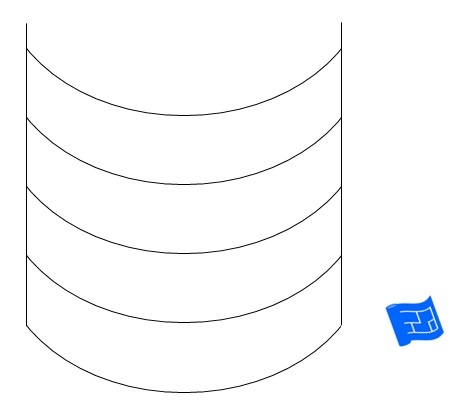 Here's an example of a curved stair wrap. And check out the glass balusters! From a practical standpoint, a few wrapped steps also provide space to place a basket that holds all the stuff that needs to be carried upstairs. 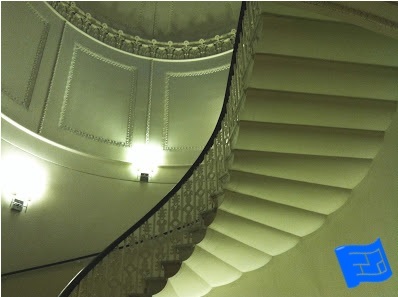 Stair wraps can be designed to fit with contemporary or more traditional designs. There’s one place where flares will never go out of style and that’s at the bottom of a staircase. 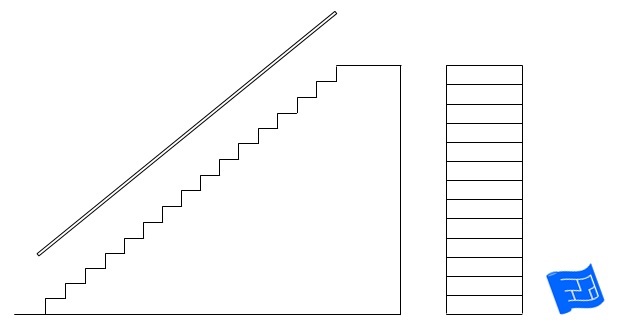 What I mean by a stair flare is a staircase where there is a variation in tread width, often accentuated towards the bottom. Think Disney princesses coming down their staircases and stare at the flair of the designs. 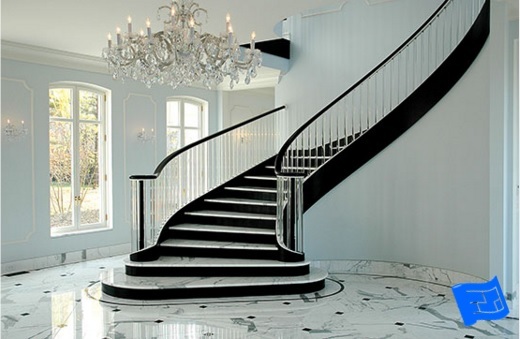 Another way to add grandeur and interest to a staircase is to design curved treads. Don't forget tread profiles as part of you staircase design ideas. 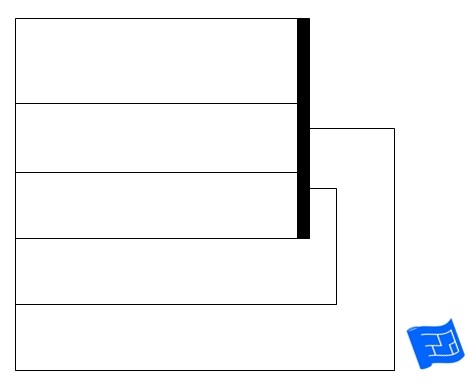 Here's just a few examples of tread profiles. 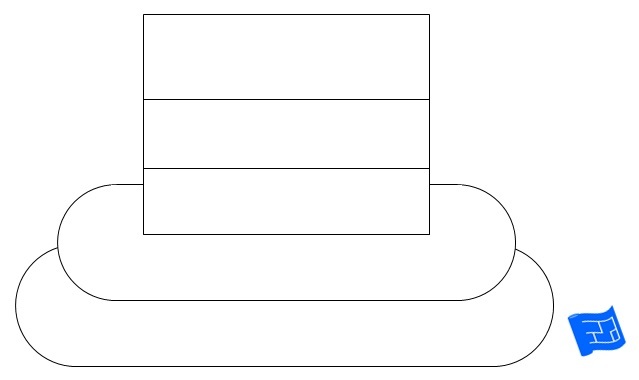 Here's the traditional stair tread profile, complete with nosing. Here's a plain design with a more contemporary look. Another contemporary design with a cut-out detail. 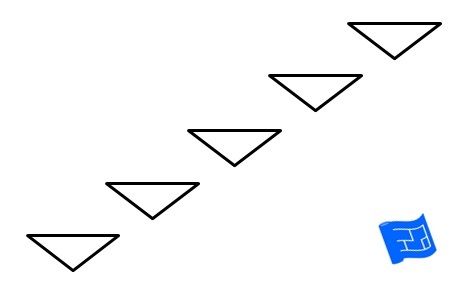 And finally a cantilevered design with treads in the shape of triangles. 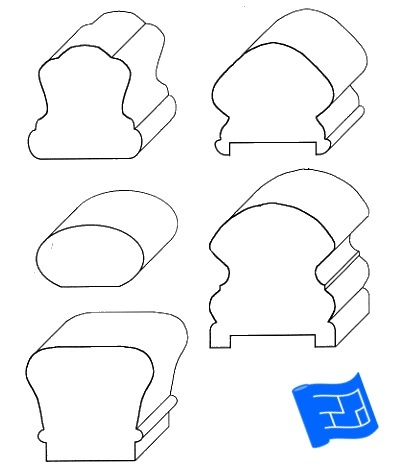 Just about any shape is possible so long as it has a flat surface. As long as there's a flat surface, anything goes. 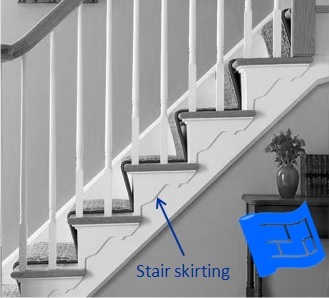 Why not add a final flourish to your staircase design by adding some skirting molding. There are lots of different designs available. I don't see it used much on contemporary staircases but I don't see why not. There's lots of scope to create a molding with simpler lines. And I couldn’t leave a section on design touches without reminding you that if you have young children, and a bit of extra room, why not design in an element of fun for the descent. Consider putting in a slide. Moving away from the treads and risers, the balustrade also presents a plethora of design opportunities. Have a look at the slide show below. One smart idea that I’ve come across is to design the balustrades so that they can be removed. This is very helpful when furniture needs to be moved up and down the stairs. You can build your staircase from a wide range of materials, most of which you can use for the staircase and for the balustrade. Don’t be afraid of mixing and matching materials, or perhaps changing materials part way down your staircase to create more interest. 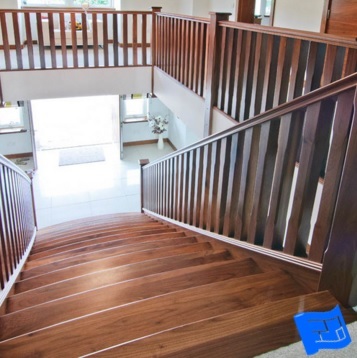 Wood is the most traditional and perhaps the most practical material for a staircase, for the fact that for the price is it very flexible. It can be made into all sorts of shapes for the staircase and balustrade. Think of all the different shapes of spindles or lattices that wood can take on. Glass can be clear or translucent or etched with a pattern. It can give a wonderful open feeling although don’t forget the practicalities of keeping it clean when you’re thinking through your design options. Ain’t nothing wrong with building the dry wall up to create a solid balustrade. If your home is a more contemporary design then metal and wire may well be on your radar for your staircase design. 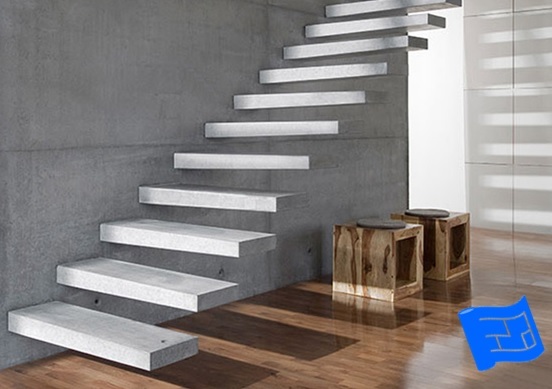 Steel is perhaps the most common material which can be formed into interestingly shaped stairs in the solid form. Wire and wire netting make a great option for interesting balustrades. If you have the budget other warmer metals such as brass and bronze are also an option. You’ll often find brick and stone used for short runs of steps in interiors at ground level or outside. For stairs to be safe they need a handrail which can be mounted on the wall or on the balustrade, or perhaps both. A standard handrail, but don’t forget, this can be made from an interesting material, and an interesting shape. A wooden handrail is more interesting when you design it with an attractive profile and perhaps a scroll or finial on the ends. The traditional way of mounting a handrail is on metal brackets. But there are other options. Why not consider a handrail that's attached to the wall along the whole of its length? Think about using an object to create your handrail. I saw an antique ladder mounted on the wall as a handrail that looked great. You could go for a rope. I have seen the indented hand rail crop up in more contemporary designs. 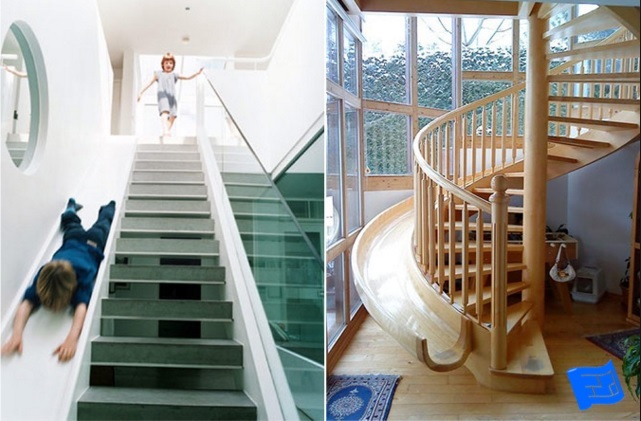 If it’s open to the bottom of the staircase and if there are kids in your home, they will have great fun racing marbles or cars or both down the inside of the handrail! 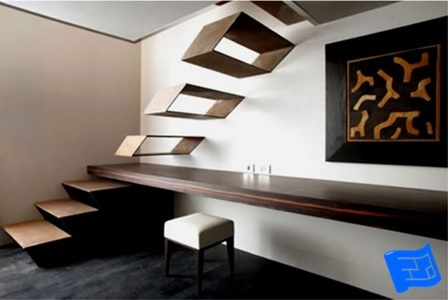 Depending on the design of your staircase, your stairs can present a great opportunity to add storage to your home. The area underneath the top of your staircase is most suited to a walk in storage area, in fact sometimes this area is big enough for a half bath or small office. The area towards the bottom of your staircase is best suited to drawers which might pull out in line or perpendicular to the stair treads. Bear in mind that if you choose drawers that pull out in line with the stair treads then you won’t be able to have carpet on the stairs. 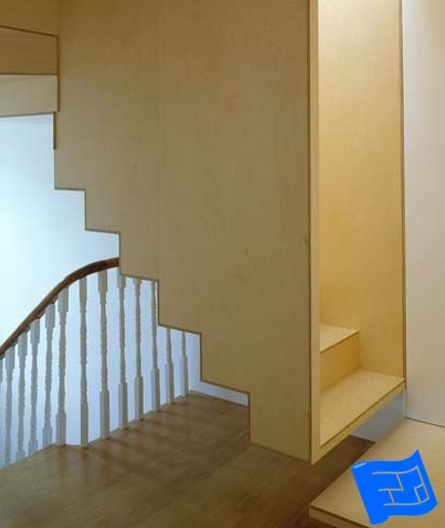 The walls around the staircase also provide a storage opportunity. 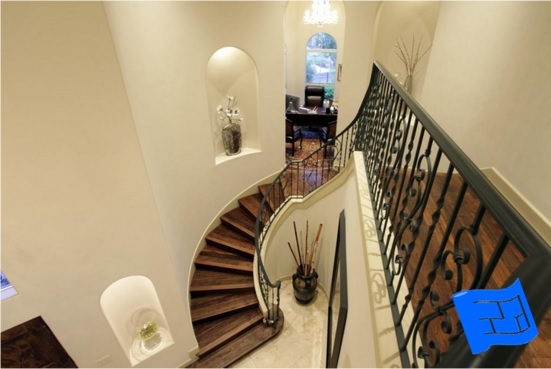 I’ve come across several examples that elevate the staircase to a sculptural work of art. Yes, staircase design ideas can be an art-form. This example re-imagines the shape of the tread and creatively uses other flat planes in the interior as part of the staircase. 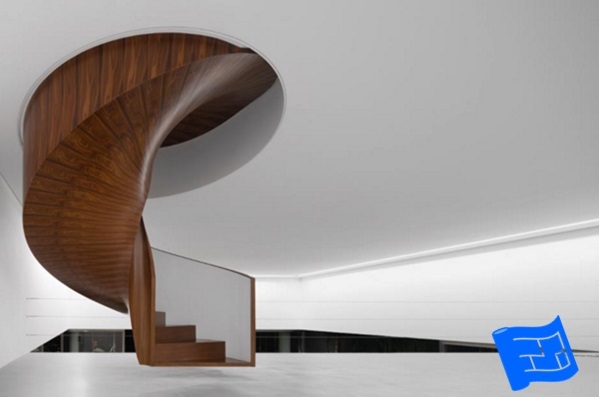 A clever sculptural staircase featuring interesting tread shapes and integrating the desk into the staircase.